A bug out bag, or GOOD (get out of dodge!) bag, is a pre-packed bag or backpack that contains essential items for short term survival in an emergency. The bag usually has enough rations for a person to survive unattended, for 72 hours. The bag itself should be medium-sized. It should be something that you can comfortably hike with on your back. When choosing the items to put in the bag, one must consider survival priorities. One thing that helps me remember the survival priorities is the rule of threes. A person can generally survive 3 minutes without oxygen, 3 hours without a regulated body temperature, 3 days without water, and 3 weeks without food. There are basic items that should be included in the bag that will help one achieve all survival priorities. In most survival situations, the first priority of oxygen will be met easily. A gas mask is not common in these bags because of its size, but it is something to consider. Our next priority is regulating our body temperature. Staying warm and dry is vital to short term survival. The bag should contain multiple items that perform this function. Water is a must in your bag. Water is heavy and takes up a lot of space. To carry 3 gallons on our back along with our other gear is asking a lot of someone. The bag should have some water (1-3 liters), but we need to be able to get water on the go. Once we are warm, dry, and hydrated, then we will want a warm meal to eat. 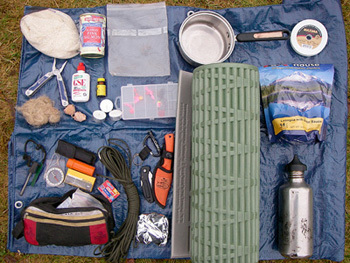 Bug out bags should have food that is easy to pack, light, and preserved. The bag should also contain items that will allow a person to get food by hunting, trapping, fishing, or foraging if necessary. These are what I consider essentials in a bag, but none of them are worth their weight unless a person knows how to use them. There are a lot of other optional items to pack in your bag (e.g. radio, sunscreen, bug repellant, reading material, etc.). Just remember that the more items in the bag, the heavier it will be. The most crucial emergency survival item, however, is not listed above. It cannot be put into your bag. The best tool one can carry with them into a survival situation is a positive mental attitude.